The Budget 1911s by Jed Henson. This ebook provides comprehensive information—i.e., photos, descriptions, specs and pricing—on 15 full-size 1911-style pistols you can buy new in gun stores or online auctions for $500 or less. These pistols are either currently in production or were within the past several years. To make this list, a pistol must cost $500 max in actual retail pricing (not MSRP, which is almost always inflated). Real World Survival: What Has Worked for Me by Walt Rauch. This paperback book discusses the hard choices we may have to make to survive in the world today. Rauch examines the importance of proper mindset and being aware of the world around us. He describes some of the characteristics of the bad guys and the various weapons they may use against us. He covers various types of self-defense tools, along with the importance of receiving the proper training, and he offers some suggestions on where to obtain such training. The book also includes sections on firearms Rauch has used throughout his career in law enforcement, as well as the pros and cons of customizing a self-defense handgun. Practically Speaking: An Illustrated Guide to the Game, Guns & Gear of the International Defensive Pistol Association by Walt Rauch. Written specifically for IDPA shooters, this paperback how-to book covers the history, philosophy, guns and gear of IDPA. More than 100 full-color photos illustrate the 80 oversized (8.5″x11″) pages, guiding the shooter from start to finish in gun and gear selection, as well as shooting techniques. Included are eight real-world courses of fire and, for the first time in print, the complete list of Rauch’s Rules for the Real World. This comprehensive manual explains the how and why of IDPA matches from a real-world perspective. Defensive Living: Preserving Your Personal Safety through Awareness, Attitude & Armed Action by Dave Spaulding. This book (available as an ebook and paperback) is a defensive training guide that contains the informational firepower to keep cops safe presented in a way that’s practical for your family to use to protect themselves, too. Filled with 50+ years of hard-earned, expert-level law enforcement and military training experience, this treasure chest of self-protection wisdom covers everything from mental conditioning for effective response to defensive driving tactics and medical self-help techniques. Handgun Combatives by Dave Spaulding. This paperback book on combat pistols can help shooters develop not only an improved technique, but also illustrates how a winning attitude can make them prevail when the chips are down. It includes information on selecting a personal handgun, stopping power, getting a grip, dealing with multiple threats, keeping sharp and many more. 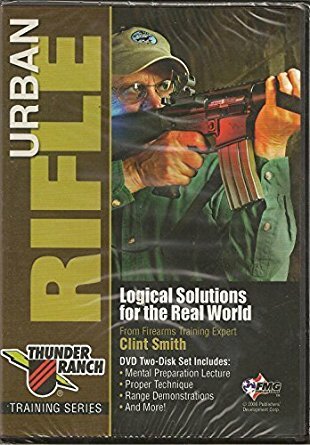 Advanced Tactics: Logical Defense Solutions by Clint Smith. In this video, Smith explains and demonstrates advanced tactics and logical defense solutions for handguns and long guns, including tactical leans, logical speed, maintaining escape routes, working with lights and threats. The two-disk set includes a mental preparation lecture, proper technique instruction, range demonstrations and more. Defensive Thinking: Logical Solutions for Home, Car, & Carry by Clint Smith. In this video, Smith explains and demonstrates advanced tactics and logical defense solutions for handguns and long guns, including tactical leans, logical speed, maintaining escape routes, working with lights and threats. The two-disk set includes a mental preparation lecture, home defense discussion, vehicle defense discussion and concealed carry options information. Urban Rifle by Clint Smith. In this video, Smith explains and demonstrates defensive rifle operation and technique. The two-disk set includes a mental preparation lecture, proper technique instruction, range demonstrations and more. Defensive Handgun by Clint Smith. In this video, Smith explains and demonstrates defensive handgun operation and technique. The two-disk set includes a mental preparation lecture, proper technique instruction, range demonstrations and more. Defensive Shotgun by Clint Smith. In this video, Smith explains and demonstrates defensive shotgun operation and technique. The two-disk set includes a mental preparation lecture, proper technique instruction, range demonstrations and more.